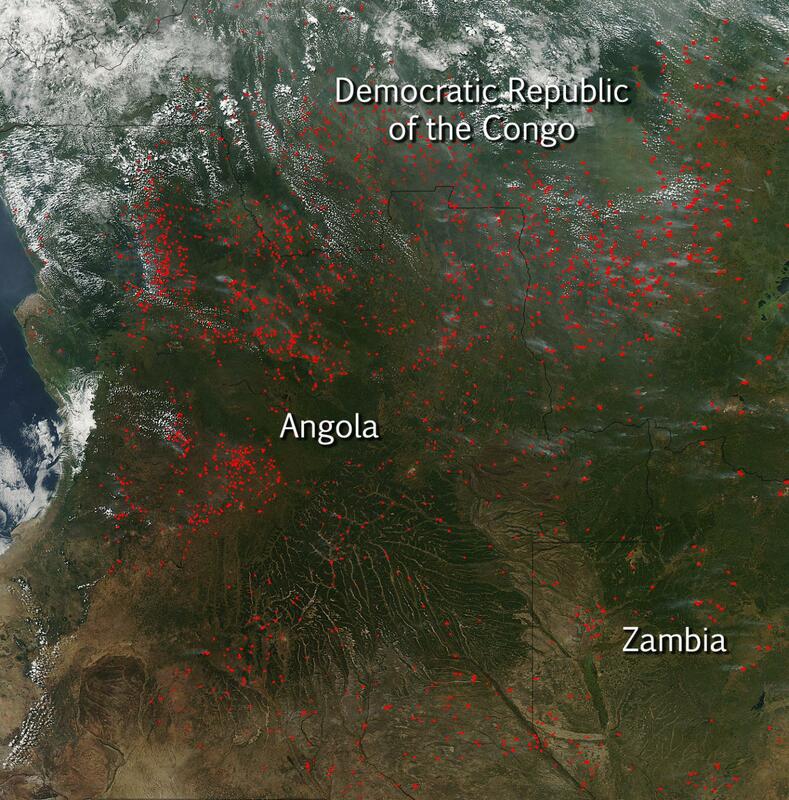 The Moderate Resolution Imaging Spectroradiometer (MODIS) on NASA's Aqua satellite collected this natural-color image which detected dozens of fires burning in southwestern Africa on May 21, 2015. The location, widespread nature, and number of fires suggest that these fires were deliberately set to manage land. Farmers often use fire to return nutrients to the soil and to clear the ground of unwanted plants. While fire helps enhance crops and grasses for pasture, the fires also produce smoke that degrades air quality. Each hot spot, which appears as a red mark, is an area where the thermal detectors on the MODIS instrument recognized temperatures higher than background. When accompanied by plumes of smoke, as in this image, such hot spots are diagnostic for fire. The smoke released by any type of fire (forest, brush, crop, structure, tires, waste or wood burning) is a mixture of particles and chemicals produced by incomplete burning of carbon-containing materials. All smoke contains carbon monoxide, carbon dioxide and particulate matter or soot.